iv+361 p., cloth, 845 g.
Choose your subscription type when entering your billing information. All prices incl. VAT 7% and excl. shipping. Orders from non-EU customers and from VAT registered customers (EU) will be exempt from German VAT. In recent Egyptian linguistics there is a vigorous debate on the question, how many concrete morpho-syntactic entities usually called “forms” are hidden under the ambiguous graphematic realisation sDm=f in the earlier stages of the Egyptian Language. The first part of the article presents an overview of several recent models for this topic, minimalistic (A. Roccati, S. Uljas, J.P. Allen; 1–2 forms; chap.2) as well as maximalistic schemes (L. Depuydt, W. Schenkel; 9/13 forms; chap.3), with some comments on theoretical basics and practicability. The second part summarizes the most relevant concepts of the prior “heroes” of Egyptian linguistics like A. Erman, K. Sethe, B. Gunn, A.H. Gardiner and H.J. Polotsky. These con­cepts and their chronological sequence make clear how early minimalistic models with poly­functional forms (Sethe / Erman) were successively elaborated (Gunn; Gardiner; Polotsky) and led to the recent culmination point with many low-functional forms (chap. 4). The last part discusses several basic errors of the minimalistic model of J.P. Allen and illustrates alternative options to determine the concrete number of sDm=f-forms and how they can be differentiated by modern scholars (chap. 5). This article attempts at reconstructing the lost portions of the (auto)biography of Shepsesptah which was found in his mastaba at Saqqarah. Based on the preserved and long known portions now in the British Museum (BM EA 682) and a fragment recently recognised in the Museum of the Oriental Institute, Chicago (OIM 11048), the text is compared to similar passages in (auto-)biographies and restored with respect to the typical phraseology attested for this genre during the Old Kingdom and with respect to considerations of structure and stylistics. Almost all grammatical descriptions of any of the diachronic stages of Later Egyptian argue for a definiteness effect in the use of relative clauses: definite antecedents may only have a relative clause with nty-/ete-, particples or relative forms, whereas with indefinite antecedents a ‘virtual’ relative clause, i.e., a circumstantial clause, must be used. The present paper discusses the evidence for this with a special view on the counterexamples and concludes that an occasionally ventured explanation as a restriction-dichotomy explains the evidence in a much better way. Thus, nty-headed clauses (as well as their diachronic successors), participles, and relative forms mark the relative clause as restrictive, while dependent clauses mark it as non-restrictive. In addition, a description of the coordination of relative expressions is presented. The present paper explores the linguistic complexity of Seti I’s Kanais Inscription through the perspective of linguistic dissimilation. The analysis focuses on the different grammatical realizations of future relative constructions (sDm.tj=fj, ntjj r sDm, ntjj tw=j/sw r sDm, and ntjj jw=f r sDm). I argue that the unusually high degree of linguistic dissimilation of future relative constructions can be interpreted as a form of linguistic inclusiveness. In the second half of the paper, further examples of linguistic dissimilation are discussed with regard to the various causal conjunctions (Hr-ntjj, p#-wn, mj, and Xr) and the different vetitive constructions (s#w sDm=f, s#w tw=j/sw r sDm, and m-jr sDm) in the text. Egyptian fractional numerals are partitive expressions of two types: (a) A simple substantive specific for naming the natural fractions ‘half’ gÈ, ‘quarter’ HÈb, ‘third’ r, ‘two thirds’ r.wj. (b) A complex partitive numeral formed with the substantive r ‘part’ and a number, r-num (meaning ‘the nth-part’), which became generalized – also for ‘quarter’ and ‘third’ – as the standard Middle Egyptian denomination for fractional numbers. Fractional numerals documented in Middle Egyptian hieratic mathematical papyri are related to their argument by means of genitival syntax: gÈ n r.wj ‘half of two parts’; oHo, r.wj=f ‘a quantity, two parts of it’. 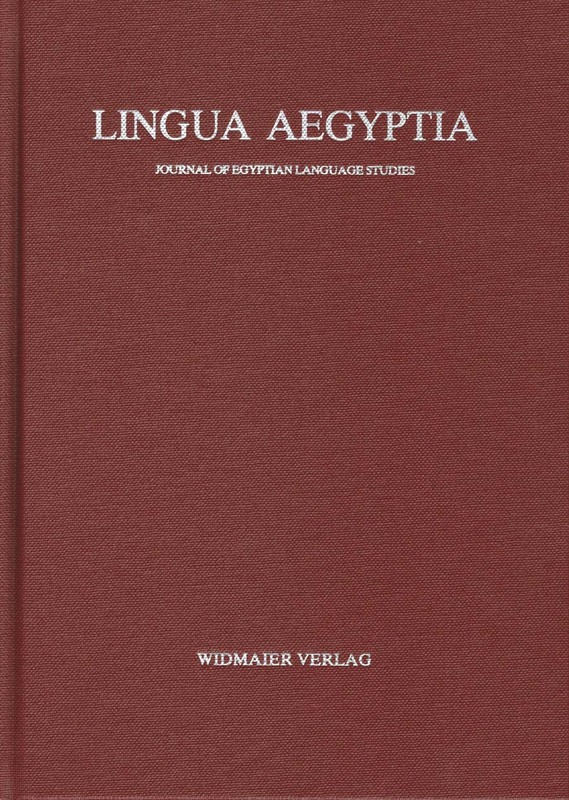 We propose a syntactic structure for Egyptian fractional numerals that specifies the lexical and grammatical categories and the linguistic operations used to build the numeral and its relation with the argument operated over. This paper considers two basic questions: 1) are there synchronic dialectal differences in the written material in pre-Coptic Egyptian? ; 2) how can the dialectal hypothesis influence our reconstruction of the history of ancient Egyptian? In addition to the classic study of geographically conditioned variants, new strategies are considered for answering the first question as the By-Pass Hypothesis, the Sudden Death Paradox, and the Unexpected Resurrection Paradox. Taking the dialectal hypothesis seriously, it is suggested that the evolution of Egyptian did not follow a straightforward vertical line of succession (from OEg down to Coptic), but that dialects played a significant role in the transformation of Egyptian. The article deals with the recent theory of D. Klotz on the origin of the 3rd masc. sing. suffix pronoun =f in Egyptian. It will be shown that his comparative approach does not withstand a critical review. In Greek filiation is usually indicated by the genitive of the father’s name, in Demotic the father’s name is introduced by a hieroglyphic sign which we read as sȝ “son of”, but was pronounced in fact as pa- “the one of”. This Egyptian filiation is rendered as πα in a few early Ptolemaic Greek ostraca and Roman period mummy labels. These constitute rare but interesting examples of language interference. A possible survivor in Coptic is rather doubtful. The various constructions of the Earlier Egyptian relative adjectives nt- and the negative iwt- suggest that the latter but not the former can express an existential meaning. However, it is argued that this meaning is not to be generalised across the different uses of iwt- and that an exactly analogous situation holds also for nn, often viewed as a universally ‘predicative’ negation. While many of the world’s languages (including Coptic Egyptian) are known to lack passives in the morphological sense, Earlier Egyptian, as manifested in the written documentation of the Old and Middle Kingdoms (ca. 2350–1650 BC), represents the diametrically opposite case of a language with multiple morphological passives and detransitivized statives with passive meaning and syntax. A. Stauder’s monograph The Earlier Egyptian Passive: Voice and Perspective addresses a range of topics that surround the language’s intricate grammatical voice system. The critical review presented here identifies several methodological, theoretical and empirical problems that the book reviewed here faces.